This luxurious six bedroom, three bathroom, privately owned, detached villa is situated on the sought - after Orange Tree Community on Highway 27. Inside, the property is spacious, with a large open plan living area, a formal dining room, a formal sitting room, a fully fitted kitchen with a separate breakfast nook, utility room and a games room. Our home is fully air conditioned and large enough for an extended family or even two families. Our home sleep 12 people comfortably, 14 with the sofa bed which is in the formal sitting room. The fully fitted kitchen has a cooker, microwave, dishwasher, waste disposal, large fridge/freezer with ice maker, coffee maker, blender, toaster and all utensils. The breakfast nook is adjacent to the kitchen and has access to the pool as does the Family room. The utility room has a washer, dryer, iron and ironing board. The games room contains a pool table, air hockey, table tennis and dart board. All amenities, air-conditioning, heating, bed linen and towels in the villa are included. There are 2 children's buggies for your use. The Master bedroom has a 37” T.V, a walk in wardrobe, en -suite bathroom with two vanity units, bath, and a large walk -in shower. There is direct access to the pool through the French windows. The queen room and two of the twin rooms have a 24” T.V, a large wardrobe and lots of storage space. In the double room, there is a 32” T.V. and the other twin room has a 30” T.V, both with large wardrobes. All our T.V's are flat screens. Outside there is a large beautiful fully screened, extremely private patio area which covers a delightful 30ftx15ft solar heated pool, plus an 8 person private spa (hot tub). 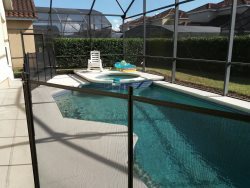 The pool and patio are east facing allowing sun worshippers to enjoy the Florida sun. It has a wrap-around pool deck with ample area for the up - graded patio loungers, chairs and table, which is a good area to relax in after a busy day at the parks. There is also a Lanai which provides a cool shaded area in which to chill out. In the neighbourhood there are facilities which include a Football Pitch, tennis courts, basketball courts and a children's play area, and it is one of the few communities to have pavements and street lights. A number of local amenities can be found just minutes away from the front gates including a First Federal bank, Post office, Petrol station, Walgreen's chemist with One Hour Photo, Super Wal-Mart, Dentist, Salon, and a variety of shops, diners, bars and with a varied range of restaurants on H. 27 and U.S. 192. Our home is near to Orlando's world famous theme parks (15 minutes to Walt Disney World and central to all other parks e.g. Sea World, Discovery Cove, Universal Studios and Islands of Adventure), it is in a tranquil setting where guests can enjoy a relaxing retreat from a day out and about. We hope that our dream home will help make all your Florida dreams come true.